Look closely at the painting to see the white prayer shawls (tallit) some people are wearing. We can also see six Torah scrolls. 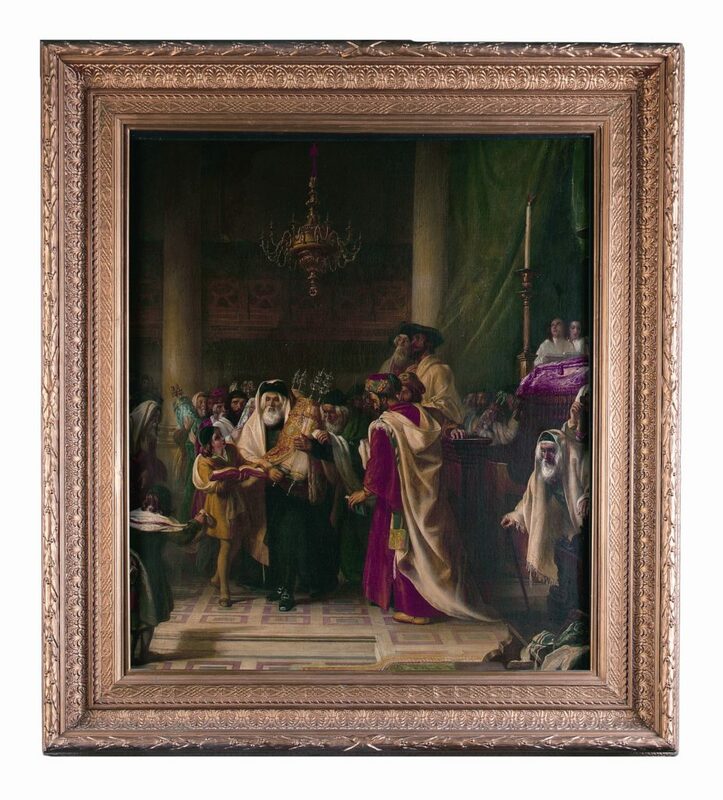 This oil painting ‘The Procession of the Law’ shows a Synagogue scene at the festival of Simchat Torah, believed to be set in the Synagogue at Livorno, Italy in 1850. There are six Torah scrolls in this painting. The reason there are so many scrolls is because the people are celebrating Simchat Torah where all the Synagogue Torah scrolls are taken out of the ark and paraded for all to see. The Torah scrolls in the painting are also beautifully decorated. Each scroll has a pair of crowns on top and a cloak wrapped around it. The Torah is the most sacred text in Judaism so it is kept covered to protect it. The Torah is dressed in the best clothing and decorations that can be afforded to show how much Jewish people respect it. Some people are wearing a tallit. A prayer shawl (tallit) is used when reading from the Torah or when praying. You can see that some people cover their heads with the prayer shawl and some people drape it over their shoulders. There are two types of candle holders in the painting; the candelabra above and the tall candlestick on the right. Light is very important in Judaism and is used to celebrate, remember and create a holy space. Although synagogues today have electricity, candlelight is still very important as it is traditional. We might wonder what sounds we could hear? We also might wonder how someone might feel at this time of year? 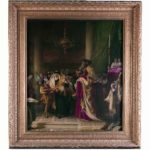 This beautiful oil painting shows a special Jewish celebration called Simchat Torah which takes place in synagogues once a year. Simchat Torah (Rejoicing of the Torah) is a day of great celebration when the yearly cycle of Torah readings ends and a new cycle begins. All the Torah scrolls are removed from the Ark and paraded around the Synagogue in a series of seven circuits with singing and dancing.